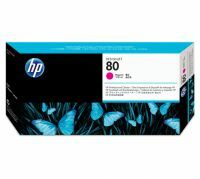 HP 80 Printheads and Cleaners are engineered to work with the HP 80 Ink Cartridges as part of a modular ink system that delivers fast printing automatically. Each HP 80 Printhead comes with a printhead cleaner that maintains the life and performance of the printhead. Printheads and ink cartridges track printhead wear and ink usage and automatically work with the printer to ensure precise black-and-color lines and high quality color renderings, maps, and graphics every time you print. C4821A HP 80 Printheads and Cleaners are engineered to work with the HP 80 Ink Cartridges as part of a modular ink system that delivers fast printing automatically. Each HP 80 Printhead comes with a printhead cleaner that maintains the life and performance of the printhead. Printheads and ink cartridges track printhead wear and ink usage and automatically work with the printer to ensure precise black-and-color lines and high quality color renderings, maps, and graphics every time you print. To Recieve updates and possible rewards for Hewlett Packard (HP) HP 80 Cyan Printhead and Printhead Cleaner please sign in. To Recieve updates and possible rewards for Printer Cartridge, Ink & Toner please sign in.